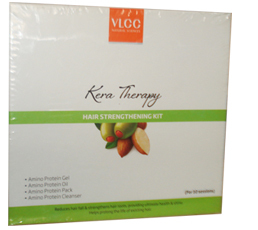 Buy VLCC Hair Fall Control Kit. Hair Fall and Strenghtens hair shaft. Hair smoothness, Hair shine. Reduces hair fall and strengthens hair roots, providing ultimate health & shine. Helps prolong the life of existing hair. This Gel with the goodness of China Grass and Wheatgerm, is specially suited for thin and weak hair. It gives shine and luster to hair. Apply the Amino Protein Gel on scalp only for 10 minutes & massage gently. Do not remove. Psoralea Corylifolia (Babchi Seed Ext) 3 %, Quercus Infectoria (Magic Nut Ext) 3%, Triticum Sativum (Wheatgerm Ext) 1%, Gelidium Amansi (Chinal Grass Ext) 8%, Cydonia Oblonga (Quince Seed Ext) 10%, Curcuma Longa (Turmeric Ext) 1%, Santalum Album (Sandalwood Ext) 0.2%, Get Base Q.S. Sesame and Almond in this specially formulated Oil, make it suitable for nourishing and strengthening the hair from the roots. It helps in reducing hair fall. After the application of Amino Protein Gel, gently massage this oil on the scalp & let it remain. Massage for 15-20 minutes , follow up with hot towel therapy for 5-10 minutes. Sesamum Indicum (Sesame Oil) 10 %, Arachis Hypogaea (ground Nut Oil) 20 % , Helianthus Annuus (Sunflower Oil)20 %, Olea Europaea (Olive Oil) 1%, Prunus Amygdalus (Almond Oil) 2%, Ocimum Basilicum (Basil Oil) 1 %, Andropogon Citratus (Lemon Grass Oil) 1%, Triticum Sativum (Wheatgerm Oil) 1%, Pyurs Malus (Apple Seed Oil) 4%, Soya Hispida (Soyabean Oil) 3%, Mineral Oil Q.S. This Hair Pack, packed with the goodness of Almonds and Soya Protein, reduces hair fall and restores nutrient balance of the hair shaft, thereby strengthening it. Make a thick paste of this Amino Protein Pack with water and apply a thick layer on the scalp. Keep it for 15-20 minutes and rinse with water. Garric (Red Earth Powder) 10%, Zincum (Zinc Oxide) 2%, Prunus Amygdalus (Almond Cake Powder) 2%, Vitis Vinifera (Raisin Ext) 1% , Acacia Arabica (Gum Acacia ) 4%, Curcuma Longa (turmeric Powder) 2 %, Helianthus Annuus (Sunflower Oil) 5%, Lactus (Milk Powder) 5%, Soya Hispida (Soyabean Ext) 3% , Kaolin Q.S. This Protein rich Hair Cleanser, cleans the scalp and hair with the gentle power of natural herbs and leaves the scalp breathing clean. After rinsing off the pack, shampoo hair with Amino Protein Cleanser thoroughly and leaves dry. Style as required. Sapindus Mukorossi (Soap Nut Extract) 4%, Acacia Concinna (Soap Pod Ext) 2%, Emblica Officinalis (Gooseberry Ext)1%, Curcuma Longa (Turmeric Ext) 2 %, Andropogon Citratus (Green Tea Ext) 1%, Pyrus Malus (Apple Seed Ext) 4%, Soya Hispida (Soyabean Ext) 3%, Cleanser Base Q.S.